Young Crafters Unite Blog Hop + Prizes! If you are arriving here from Tania A's blog, you are the right place.If you’re not sure what this blog hop is about or what you’ve stumbled upon, you can go here to the main blog hop website. The theme for the hop is "Our Favorite Things" and I have tried my best to incorporate some of my favorite things on today's card. It is inspired by one of my favorite crafters of all time Vicky Papaioannou card here. I am using my favorite technique of stamping and emboss resist and one of my favorite color combo of red, vanilla and raw sienna. As to what makes me young apart from my age (if you consider 27 to be young :D) is that I am a kid at heart. I enjoy little things in life, giving and sharing and learning new things. Thank you for visiting my blog! Make sure to check out the blogs that follow for some jaw dropping creations and for a chance to win! Randomly selected commentators will have the opportunity to win prizes from Simon Says Stamp, Paper Smooches and Lawn Fawn. Next blog hop stop is talented Amber R.
I am entering this card for Lily Pad Inspiration Challenge#3. What a lovely card! 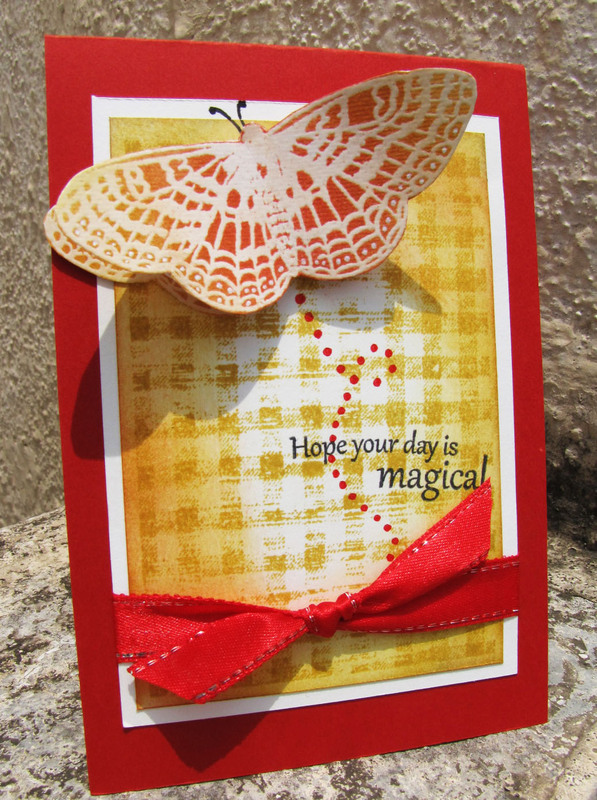 I really like the colors you've used here, and I love the touch the popped up/folded up butterfly's wings add to this card =) Thank you so much for joining our bloghop! oh ! !THAT butterfly rocks !! Your card is wonderful and those colors do look fabulous together. Butterflies are one of my favorite features to add to a card also. Love that enormous butterfly!! super super cute!!! Having so much fun!! off to hop!! oh the butterfly is just so gorgeous and so is ur color combo, very pretty card. i dun know .. from where to hop ? aditya has no post ?? super magical goodness! LOVE the colours and the butterfly! This is entirely too cool! Love it! Great bright card as usual!..Loved the butterfly and the color combo!. Wow, this is gorgeous! You can't go wrong with Vicky as your inspiration! I'm so glad you played with us in the Lily Pad pond! I love your color scheme and the butterfly! great card. I always love Vicky's cards so I can see how you found inspiration in her! Lovely card! The red and yellow together is gorgeous! I love Vicky's style, too! Your card is very pretty! the distressing is lovely! TFS! Truly a magical card :) Love butterflies!! Beautiful card, I love your butterfly! Super pretty card, the background is great! Vicky is so inspiring! Your card is beautiful! Love the bright and cheery colors! Love the resist on the butterfly. Oh, I love your layered butterfly!! Love the butterfly! Will try to do it once I have some butterfly stamps. Very pretty! I love this color combo too! I like the popped up butterfly! Lovely card... that butterfly is beautiful. What a delightful project! Have a fabulous 4th! What a warm and lovely card! What a lovely card! Great colors... and I just love that butterfly! This is beautiful! Love the butterfly! Great touch with the curved wings!! Beautiful card. So much to like about it. Colors, compostion, distressing! Your card is beautiful! The colors work so well together. LOVE this color combo & that butterfly is just beautiful!! this is beautiful :) loved the big butterfly! This is a beautiful card, the background is gorgeous. Great embossed butterfly and the colors on it make it outstanding. Really really beautiful. I love the color combo too!! Simply wonderful. Wow, I love that color combo too. The red really makes everything pop! Thank you so much for joining us on the Young Crafters Unite blog hop! There's no one like you, Friend! I am BACK + Winners! Pillow treat box + Giveaway!